Attorney Lee Allen Phillips bought lots 3 and 4 and the easterly 20 feet of Lot 5 from Berkeley Square developer William Burke in November 1905, hiring Myron Hunt and Elmer Grey to build two years later what was, before citywide annexation-related renumberings in 1912, addressed #4 in accordance with its center lot. In 1908 Phillips added a garage with servants' quarters to the rear of the property. By the time he built what became the new #4 across the street in 1913 and sold the old one on the north side to Willis Hunt, it was renumbered #5, our subject today. It should be noted that the lot configurations at the northeast end of the Square are difficult to sort out. Los Angeles real estate operators Waller G. Chanslor and O. A. Vickrey appear to have bought and sold various combinations of these lots, which may or may not have involved the property eventually belonging to #5; Chanslor would later build #7 next door, though Vickrey seems only briefly to have held Square property. Ellen and Mary Faith, as seen at top. While by rights 5 Berkeley Square could be called the First Lee Allen Phillips House, or the First William Gustavus Hunt House—for it was both of these—we're going to call it the William Gibbs McAdoo House after the California senator and one-time Presidential son-in-law who lived here from 1922 to 1939. McAdoo was the U.S. Secretary of the Treasury from 1913 to 1918, but that was only part of his prolific business and personal life. A Tennessean by way of his native Georgia, born during the Civil War, McAdoo became a Chattanooga attorney and street-railway entrepreneur and had married and had seven children before moving to New York to found a securities firm, eventually taking on the leadership of the tunneling under the Hudson that is today part of the PATH system. President Woodrow Wilson took notice of McAdoo's accomplishments, appointing him to the Treasury; McAdoo took notice of something else. A grandfather by this time, in 1914 he married 24-year-old daughter of the White House Eleanor Wilson, 26 years his junior, and proceeded to have two more children. His moves as Treasury secretary were bold and are considered legendary, but after his term as treasurer he refocused on his law practice, advising in the formation of United Artists and initially holding a 20-percent stake in the company alongside Charlie Chaplin, D.W. Griffith, and soon-to-be-married Mary Pickford and Douglas Fairbanks. California was calling. 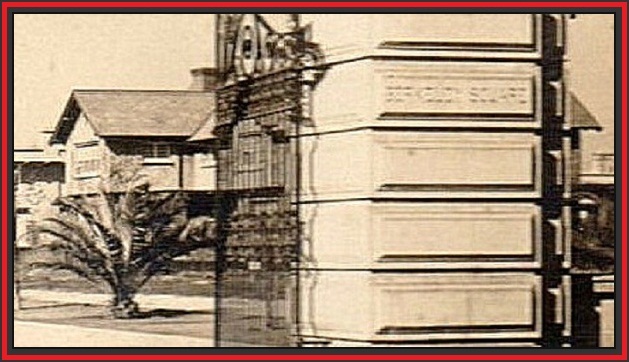 view taken from the Western Avenue gate circa 1913, around the time of Hunts' arrival. just across the street at 4 Berkeley Square, as seen here. The McAdoos appear to have lived quietly on the Square through the '20s, William running for the Democratic presidential nomination in 1924, as he had in 1920, both times unsuccessfully. Eventually his political ambitions resulted in his becoming a U.S. Senator from California from 1933 to 1938. Eleanor was disinclined to spend any time in Washington, apparently loving California more than her husband—"more than her husband" in the sense that she divorced him in July 1934 on grounds of mental cruelty in order to stay on the West Coast. (The New York Times reported cryptically that the decree was granted rather unusually within an hour of its having been filed.) 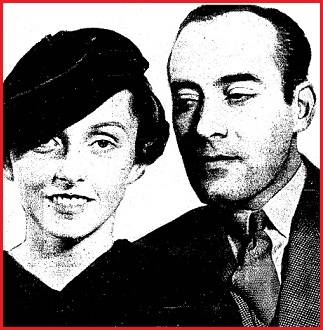 McAdoos were to keep the divorce courts—and the press—humming in the mid '30s. 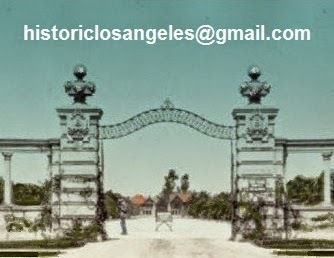 In 1923, the Senator's son Robert had married Los Angeles developer Robert Rowan's daughter Lorraine, for whom a boulevard is named in her father's Windsor Square tract—the two split in June 1936, with Lorraine immediately announcing her intention to marry a 22-year-old. Robert died of pneumonia seven months later; he is buried with his father and brother William Jr. at Arlington National Cemetery. Meanwhile, the Senator and Eleanor's elder daughter Ellen was "acting out" and courting disinheritance by eloping with considerably older Filipino actor Rafael de Onate in November 1934. The age difference was probably of little concern to her parents, 26 years apart themselves; rather it was McAdoo's unreconstructed Confederate ideas on race that raised his hackles. On the face of it, in addition to being an afront to her snobbish father, Ellen's marriage was considered to be against California's miscegenation statute. Once the groom proved that he was actually a Spaniard—or at least once Ellen turned up pregnant—objections of state and father were dropped. In the event, Rafael proved to be something of a layabout and was out of the picture a few years later. His son, born in July 1935, was later adopted by his grandfather who deracinated him by changing his name from Ricardo Lopez de Onate to Richard Floyd McAdoo. (William Gibbs McAdoo was nothing if not proud of him name.) Divorced in 1937, Ellen briefly pursued a singing career before marrying a symphony French-horn player from Kansas City the next year. Another divorce and another child later, Ellen ended up as a telephone operator, dying of an overdose of something unspecified in Santa Monica in 1946, age 31. Who knew? Never one to let grass grow under his feet, 71-year-old Senator McAdoo married 26-year-old public health service nurse Doris Cross in 1935. It appears that Eleanor moved out of #5 after the divorce. The Senator and Doris were listed in city directories at #5 until 1939 when they moved to Santa Barbara. He died in Washington two years later. Quite a life. Who might have owned #5 after 1939 is unclear. Perhaps the McAdoos threw sheets over everything after moving up the coast, the Senator's death and the war years keeping the house closed, but one of several Berkeley Square families who occupied more than one house was in residence at #5 by 1949. The senior William Bayley Coberlys arrived on the Square following their son William Junior and his wife Lena, who had moved into #12 in 1941. 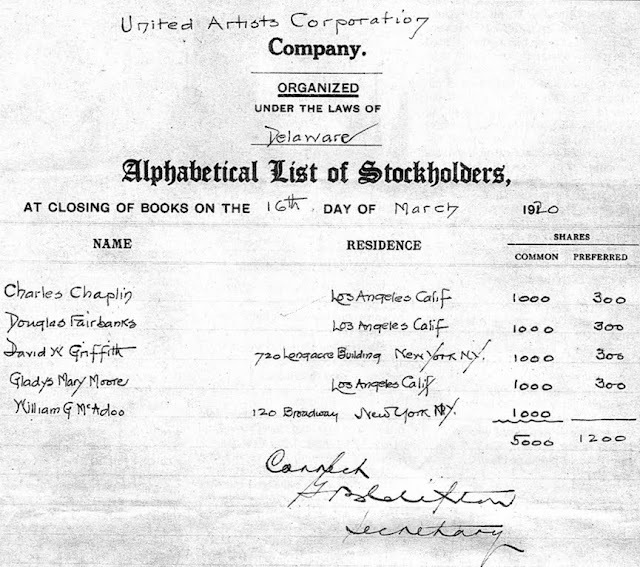 The length of Bill and Winifred Coberly's stay at #5 is unknown. But by 1955, there was a new tenant. The eminent Los Angeles physician Dr. Ruth Janetta Temple was next to live at #5. Before Dr. Ruth, there was Dr. Ruth: Dr. Temple saw the need for medical care in southeast Los Angeles and opened the first health clinic in that district in 1918, the same year she became the first African-American female to be graduated from Loma Linda University. Dr. Temple and her husband, Otis Lawrence Banks, a real estate developer, bought a house on the East Side for her clinic, the first of several that provided free medical services to the community. For many years she served with the Los Angeles Health Department, which in 1941 offered her a scholarship to pursue a master's degree in public health at Yale University. She was appointed the first health officer of Los Angeles in 1942 and was recognized as an authority in the field of obstetrics. 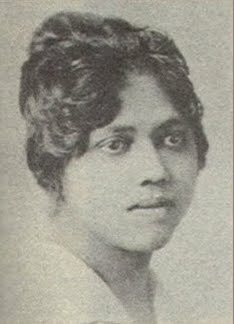 In further trailblazing Dr. Temple became an instructor at White Memorial Hospital in Boyle Heights, teaching white medical students. The world was changing, and Berkeley Square was changing along with it, in several senses. Dr. Temple and family members were still in residence at #5 in 1959, though Otis died in August and demolition of the north side of the Square was to begin within the year. 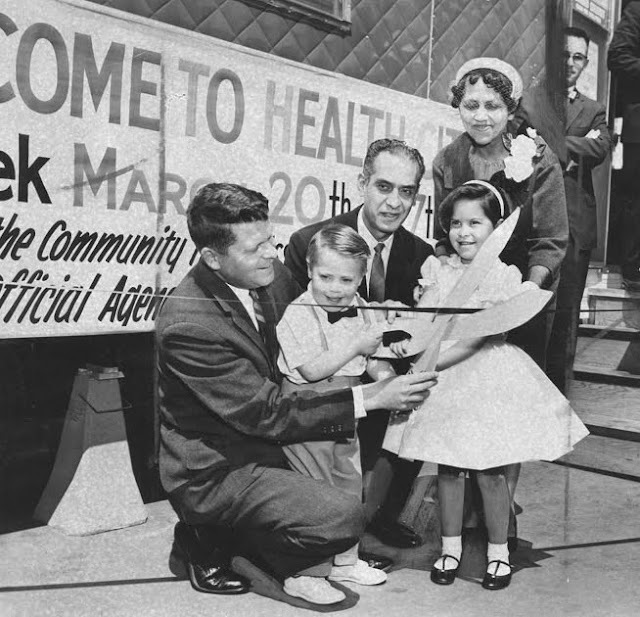 Like Senator McAdoo never one to sit still, Dr. Temple moved on to another house in West Adams, the Lucien Grays' at 2515 4th Avenue (see #7), remaining active until she died in Los Angeles at age 91 in 1984.
to administer the Salk polio vaccine.